SAILKARMA.COM - Sailing News, Videos and Photos! : Speedboat – A VO70 on Steroids! In yesterday’s blustery weather the new Juan K designed 100ft maxi, Speedboat, was launched in Auckland’s Viaduct Basin. It's a yacht designed to produce blustering speeds, so it goes without saying that her rig is the ultimate collaboration of latest design thinking and innovation in rig technology. 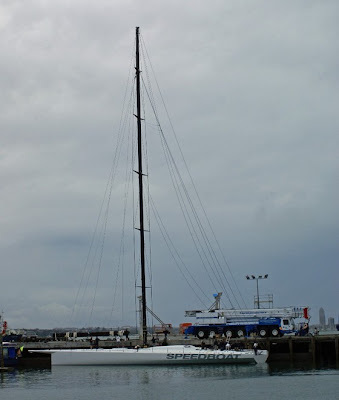 The 44.3 metre high deck-stepped mast was designed and built by Southern Spars, and is the tallest and most powerful maxi rig produced by the company yet. Speedboat’s 5 spreader cathedral in-line rig is built from high modulus carbon fibre and is equipped with a complete set of EC6+ carbon rigging – the same rigging product used on Open 60 yacht Paprec-Virbac, winner of the Barcelona World Race. One of the most noticeable features on Speedboat’s rig is the truly aerodynamic structure. The rig uses EC6+ carbon continuous rigging with internal tangs. This means the entire rigging runs free from the deck to inside the mast without any bulky external fittings or attachments. 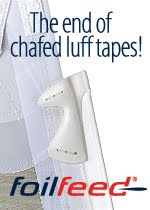 Because there are no bulky end fittings on spreaders, the spreader ends are considerably smaller, making for a cleaner, lower drag spreader end. The runners are also made from EC6. The internal halyard locks will have some of the biggest loads seen on a racing yacht, with the halyard lock for the Code Zero sail having a 20 tonne safe working load. SpeedBoat is due out on her maiden sail tomorrow, 17th April, where sea trials will commence.